Here it is, a list of how to get into on-road R/C racing in two different classes (your choice) on the cheap. I’ll update this list and go into detail about the the components I find important. Mostly I wanted to make a list of everything I’ve purchased to keep things honest. In some cases where I’ve ordered online, I added in the shipping cost where indicated, and added “used” if I bought it second hand. Other costs from my local hobby shop (LHS) include sales tax. Keep in mind I may have received discounted prices or shipping, or used a club discount at my local hobby shop – you should too. I’ve used these components in both of my racing configurations, so I put them here as a base. 12V Power Supply – Build one for free from a used computer power supply. I was initially drawn to the USGT class because I like the style of cars. They look like racing versions of production cars you’d see on the road today. Alas, it proved to be too fast for me to start there, but I aspire to be back when my driving improves. A little over $500, but not bad! I actually started with a HPI RS4 Rally chassis that I converted to a RS4 Sport. I bought it used and expect that buying used could get you an even better, more modern chassis than those listed here for $150 or less and it may include some electronics. The Vintage Trans-Am (sometimes abbreviated USVTA or just VTA) class is slower and more friendly for someone that just wants to learn to drive. I enjoy a cool-looking muscle car just as much as the next guy. Bring on the nostalgia! This specific HPI ready-to-run (RTR) car gets you very close to the US Vintage Trans-Am spec. It includes spec wheels, tires, and a painted body which would normally cost you at least $76 when purchased separately. The US-spec VTA is creeping up towards $600, but it’s still nowhere near $1000. It’s unlikely that your local club will require minor details like the driver figure – it’s only strictly necessary if you want to compete at big events. Also note that the 25.5T motor cited here is not (yet) ROAR approved. You should ask your local racing club if this is an issue or not before purchasing. Now, I never said you’re going to go out and immediately take first place with these setups. It’s just to get you out there. 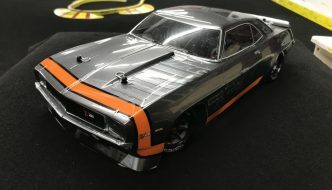 However there are rumors that both the HPI Sprint 2 and Associated TC4 chassis’ have been competitive in Vintage Trans-Am in recent years, so get out there and prove it!